than you have certainly landed in the right place. We have specifically designed the best harem pants which you'll definitely want to buy. The first and foremost important reason to get these pants is mainly that of its premium quality and enduring material. This makes it perfect for long-term use. Moreover, the fabric used to design these pants is extremely soft and comfortable which also makes it perfect for wearing for long hours. Amazing, right? Well, that's not it!!! Other than this, the print of these harem pants is perfect as well. The amazing too. The stretchable waist and loose baggy style make it completely distinctive and inimitable. Moreover, these pants are available in every size making it easier for you to find out your size. So, top it off with a crop top, a tee-shirt or a frock, whatever you like, it will look perfect for every occasion. So, don't wait any longer, change your style and try something new. You'll love it for sure. Premium-quality material: The material used to design the printed harem pants is of premium quality. It enduring and high-quality material makes it perfect for long-term use. Trust me, you can wear it for years and the material won't damage. Comfortable: The fabric used to design these premium-quality harem pants is highly comfortable and soft. No matter how long you wear it you'll feel completely easy and comfy in these pants. Stylish: Other than just the quality, the style and design of these soft harem pants are also exceptional. The baggy style on the top with a tight stretchy grip at the bottom makes it perfectly stylish for casual as well as party wear. Printed: The pants are printed. The print of the pants is impeccably flawless. The unique floral with a mix of Arabic pattern makes these pants unique and inimitable and is perfect to wear with a crop top a tee-shirt and even a short frock. 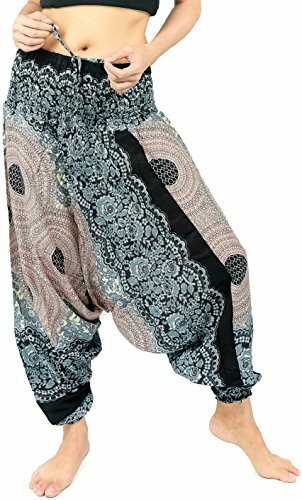 Different sizes available: The reason why these best harem pants are totally perfect for you is mainly that they are available different sizes which makes it easy to fit. Whether you want a small size or large we always keep our stock updated. If you have any questions about this product by vvProud, contact us by completing and submitting the form below. If you are looking for a specif part number, please include it with your message.